It contains Moss Agate, Smoky Quartz, Obsidian, Shungite powder, Sage Rose Petals, Mica Flakes, 24 K gold flakes, copper flakes, Metal shavings, Clear Quartz Crystal wrapped in copper wire for better conductivity, Copper coil, Black Sun Iron Oxide nano powder, highest jewelry grade epoxy resin. Smoky quartz is a very protective and grounding stone. It brings physical and psychic protection. It is also an excellent stone for protection from negative energy, as It removes negativity and negative energy of any kind and transforms them to positive energy. As a root chakra stone, smoky quartz enhances survival instincts, and can help one reach personal and business goals. It is also used in assisting in making wishes come true by grounding their essence in reality. Thus, it is a stone that brings abundance, prosperity, and good luck. It engenders creativity by bringing the same energies of grounding the creative process in reality to bring imaginative efforts to fulfillment. Black Obsidian is a powerful cleanser of psychic smog created within your aura, and is a strong psychic protection stone. 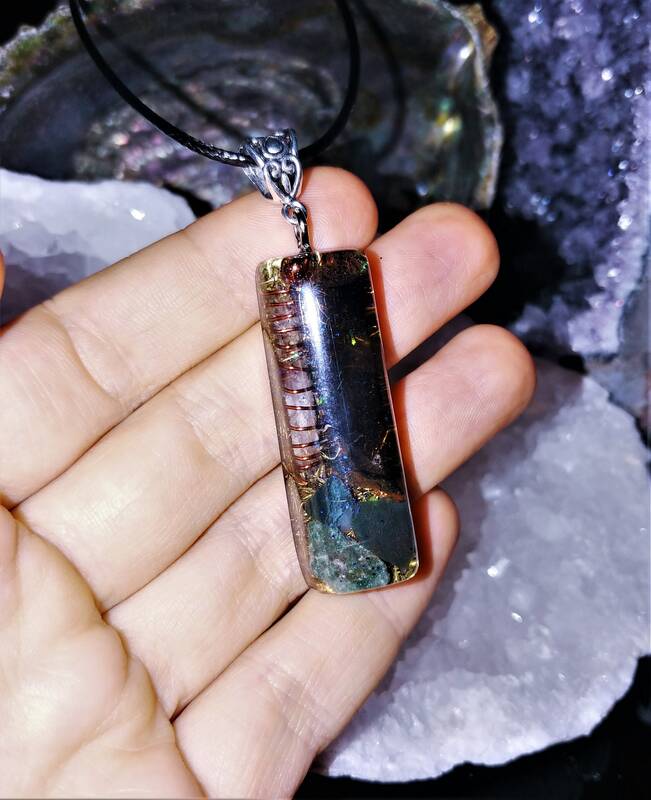 It has powerful metaphysical properties that will shield you against negativity, and the energy of these stones may stimulate the gift of prophecy. It an excellent crystal to use when you have been doing spiritual or healing work... as it has a strong action to ground you to Mother Earth.This black stone is excellent to assist you to release disharmony that has built up in your day to day life and during work on yourself, including resentment of others, fear and anger.